You think you might want to own a house. The problem is, you’re not sure when it makes financial sense to buy. 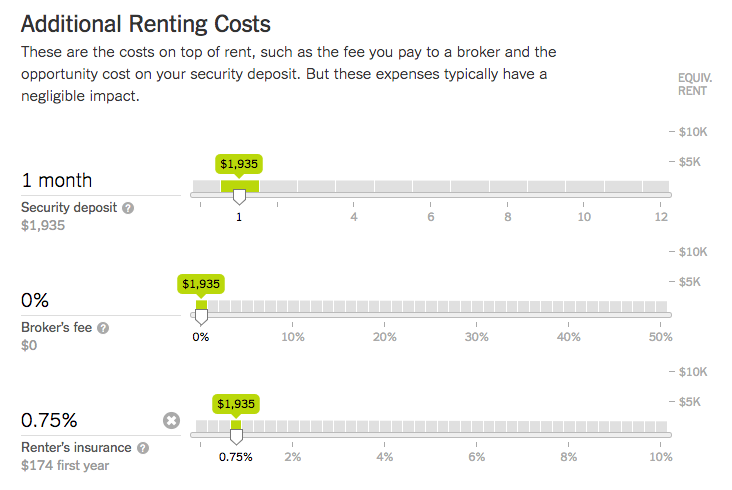 What about the fact that mortgage payments are usually higher than rent? Would you make more money investing the down payment somewhere else? 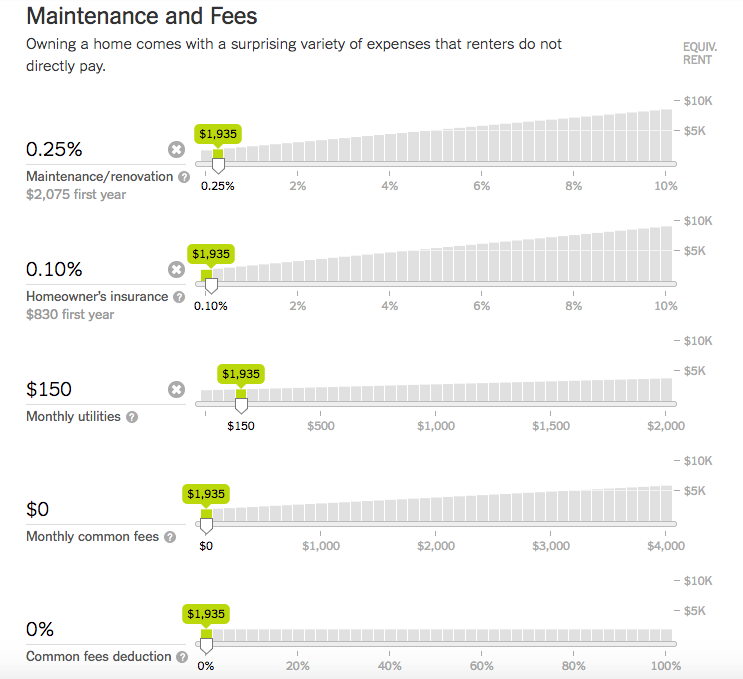 And what about those “hidden costs of owning” (maintenance, insurance, etc.)? 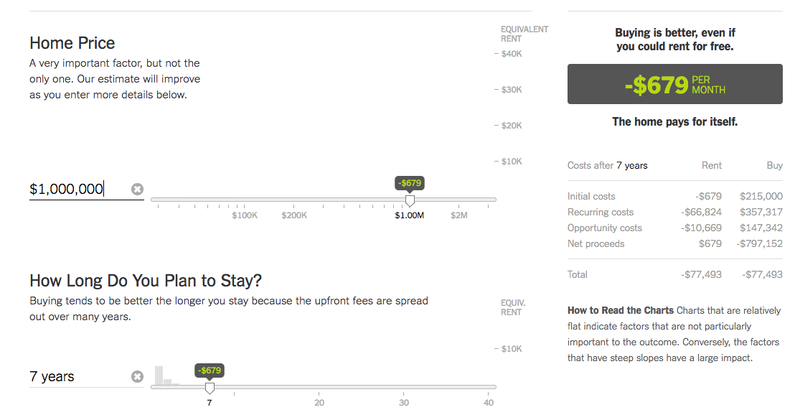 Buy vs Rent calculators are designed to answer these questions. It has just the right amount of granularity, is easy to use, and provides detailed explanations of how each input affects the final calculation. Before answering that question, I’d like to provide a shorthand. 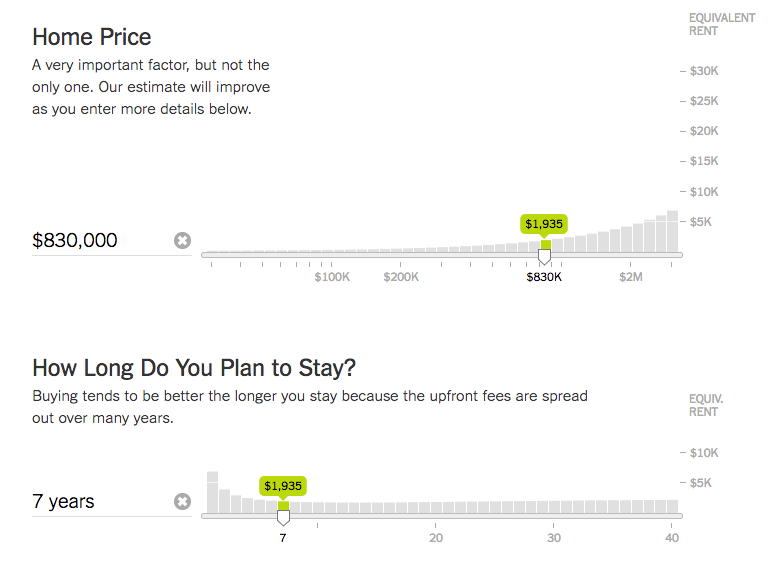 The reason the New York Times allows you to change inputs is that different markets have different prices. But if you narrow your search to a single market, all you need is a simple multiplier. I am calling it “The 415 Rule”. 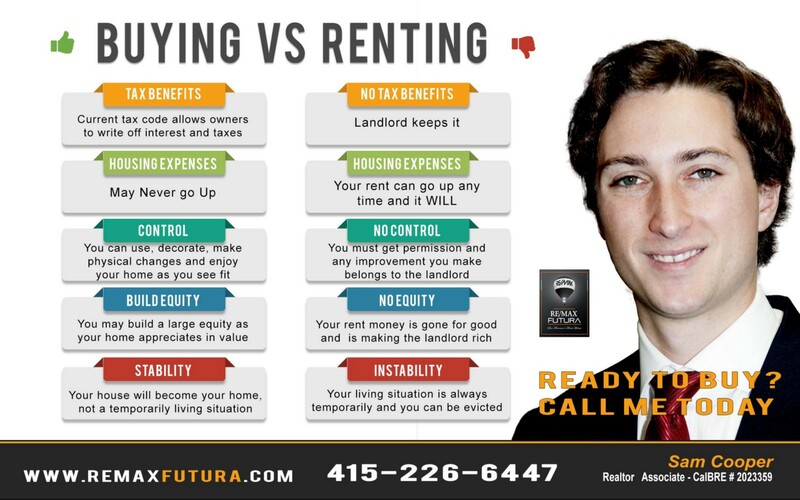 Essentially, in San Francisco, if you multiply your current monthly rent by 415 you will find the break even point of renting vs. buying. That means if your current monthly rent is $2,000, you’re better off buying a house that costs less than or equal to $830,000. Okay, so it’s not exactly 415. The true multiplier is closer to 425. And yes I am naming it “The 415 Rule” because the San Francisco area code is 415. It’s memorable… okay! It’s also conservative, because a 415x multiplier yields slightly lower purchases prices than 425x. 415x is approximately the proper multiplier IF you plan to live alone. 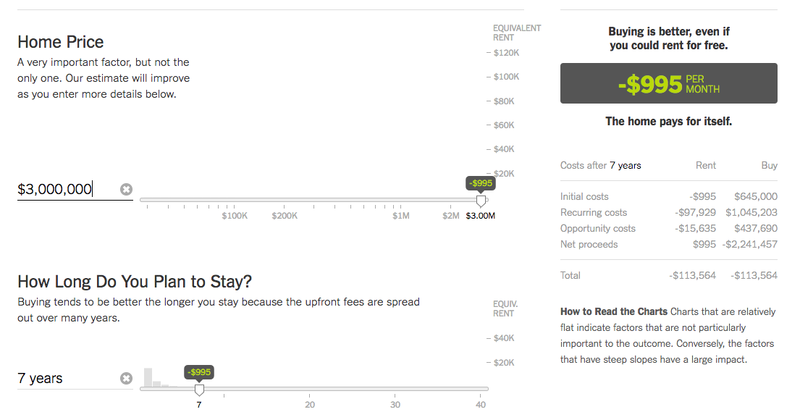 But if you buy a 2-bedroom condo and have a roommate who pays you rent, the multiplier increases. Assuming your roommate pays rent of $1,500, your new multiplier is 500x as opposed to 415x (again, slightly more than 500x, but still trying to be memorable here). 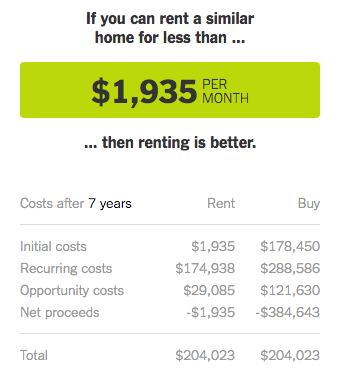 Thus, if your current rent is $2,000 a month, you can buy a 2-bedroom condo for $1,000,000, charge your tenant/roommate $1,500 a month in rent, and be significantly better off than you were renting. 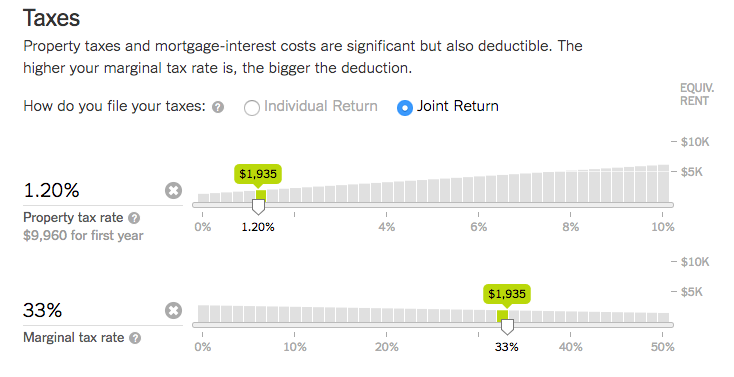 Savvy buyers should want to see the assumptions of this financial model. 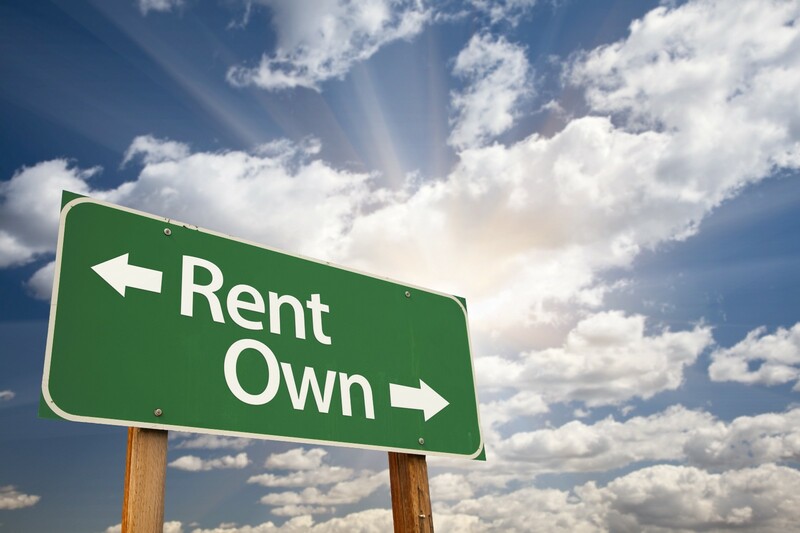 See FAQ for comments on “home price appreciation” and “rent price appreciation”. Mortgage interest rates change. But all other inputs are fairly constant for San Francisco. Here they are… plug them into the New York Times calculator and see the result. Q. 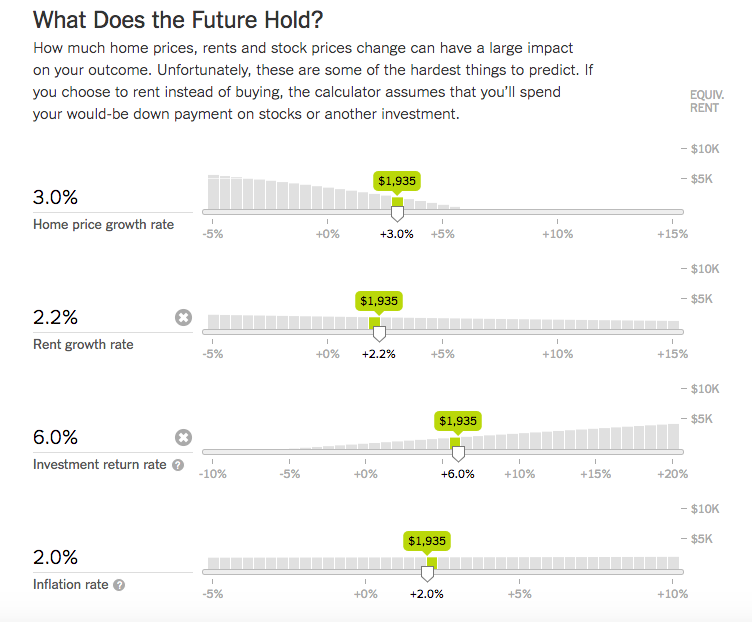 Are the annual home price and rent price growth rates realistic? A. Actually they are on the conservative side. Average home price growth rate for San Francisco is 7.37%. Market rate rent price growth rate historically has been closer to 5–6%. I prefer to be conservative. So I chose a lower home price appreciation rate (3.0%) for this model. I also chose a lower rent price growth rate (2.2%), which is approximately the growth rate under rent control. Just for fun, take a look at the break even point with 7% home price growth and 5% rent growth rate. At historical average levels of appreciation, buying a house in San Francisco pays for itself… regardless of your rent. Now you see why San Francisco is such a hot market for investors? Q. If my mortgage payment is higher than my rent, how am I saving money? A. 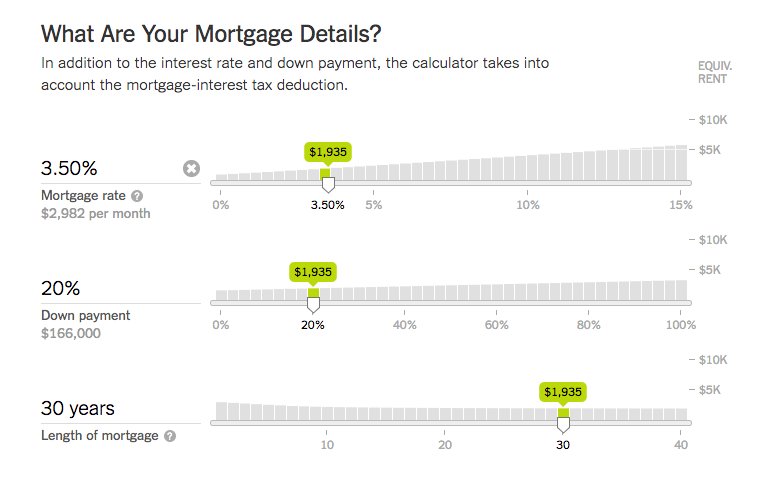 In the example above, your mortgage payment would be $3,354 a month. However, over 7 years, an average of only $2,024.40 per month of that payment goes to interest. The rest builds equity — an investment in your future. In effect, buying a house is a way of forcing yourself to save money. Q. You say I can buy a $1,000,000 home with a roommate paying $1,500 a month in rent. But are there any 2-bedroom homes available in San Francisco for under $1,000,000 these days? A. Yes! More than 950 2-bedroom homes and condos sold for under $1,000,000 in 2016. Q. Where does the Home Price Growth Rate come from? A. The average annual appreciation over all 7-year periods from 1995–2016 is 7.37%. The example growth rate above (3.00%) is a very conservative figure. Data is sourced from the San Francisco Association of Realtors. Thanks for reading! Feel free to hit the recommend button below if you found this piece helpful.